Gary Warby , Managing Director, argues that low availability of properties, house price increases and the cost of moving home, means extending your existing property makes more sense than ever. If house price inflation has slowed a little, it has done nothing to address the housing affordability gap. According to the Office for National Statistics, the average UK house price stood at £221,000 in May – up by £10,000 on the same time last year. The main contribution to the rise coming for a jump of 5% on house prices in England, where the average cost of a home is now £238,000. With increases in earnings failing to keep up and with fewer properties coming onto the market, moving up the housing ladder, for those who are already on it, is becoming increasingly difficult. And even if you find your perfect property, you need deep pockets, not just for your new purchase but also for professional fees including estate agents and solicitors, plus surveyor costs – all of which are higher with increased house prices. This is not to forget stamp duty at 5% on properties sold at between £250,001 and £925,000. This would mean paying out almost £12,000 alone on stamp duty on the average house price in England. Increase the value of your purchase property to £350,000 and you’re heading for £18,000 – just on Stamp Duty! With house prices and the costs of moving home so high, it means that if you already have a property, increasing your living space, may be a far more cost effective not to mention, less stressful option. You may also be pleasantly surprised by how far that £20,000 or so that you saved on Stamp Duty and professional fees may take you. A loft extension or basement conversion, if you have one, are obvious ways to increase the square footage of your home. They also represent good investments if you sell your home again in the future. Modelling of return on investment suggest the average UK loft conversion costs around £25,000 but will add around £10,000 to the value of your property on top of what you’ve paid for it when it’s done. The downside is that it can be very disruptive, creating dust and disruption, particularly to bedrooms during construction. Loft conversion may give you another bedroom but they also won’t give you more downstairs living space, which means that you may want to consider an extension. This will set you back a little more. How much will an extension cost? An estimate for the cost of a single storey extension outside of London – where it’s significantly higher – is anywhere between £1,200 and £1,500 per m2. That means for a 5m x 5m single storey extension the cost of the build alone is going to be around around £30,000 – that’s before professional fees, for example architects and then VAT, which bring it to around £39,000. Once it’s done it can, however offer some pretty substantial returns with a kitchen extension adding around £20,000 in value on top of what you’re paid for it. The downside is that you’re living with builders and construction can run on for months. Are there lower cost alternatives to a traditional home extension? A quicker and significantly lower cost way of extending you home is to consider an alternate build model and you may already be sitting in it. There are a huge number of unloved conservatories gathering moss on the back of UK homes. Many of these can be upgraded, either installing new solar control and energy efficient glass, to create comfortable ambient temperatures and year-round living space. But depending on your type of conservatory you may be able to replace it with a solid roof system. This can be installed in less than a day. Your old roof is removed and the new solid roof is reinstated, without the need to remove windows and doors. This looks exactly like a standard vaulted ceiling on the inside while outside, it looks like a normal tiled roof, creating a far more substantial extension-type look and feel. We supply the UltraRoof. It’s a modular solid-roof system which emulates the appearance of a traditional batton and tile roofing system but is far more thermally efficient and quicker to install. And because its lightweight, it’s ideal for retro-fit to lots of existing conservatories as a replacement roof. 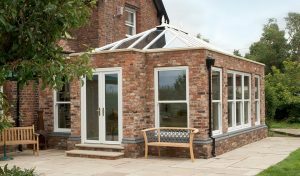 It means for a comparatively low cost you can add a solid-wall and a solid roof, completely transforming the appearance of your existing conservatory. Alternatively, if your budget stretches to it and the design and construct of your pre-existing conservatory allows you can go a step further. This is where an UltraRoof could really transform your property. Your conservatory will already have a damp course, concreted floor and footings in place. In many cases these can be stripped back and rebuilt, only this time using less glass and bringing the walls higher right up to the wall-plate. Simply add the UltraRoof on top and new bi-folding doors and you have a traditional ‘bricks and mortar’ extension but in a fraction of the time and cost. This will work in theory for any gable, Georgian, lean-to or T-shape conservatory, although we would always advocate a full survey first to assess the suitability of footings before undertaking any building work. The UltraRoof solid roof is also suitable for use in new build as a much faster alternative to traditional roofing systems, making your new extension water tight in less than a day once the wall-plates are completed. Pre-fabricated off site with exacting precision, the modular system simply slots and fixes into place and is being used by a growing number of builders, reducing overall costs and time on site.